At DutchCrafters, we bring you a selection of fine Amish furniture made of the premium hardwood that you choose. From our Amish woodworkers shops in Pennsylvania, Ohio and Indiana, all of our pieces are handcrafted with your family in mind. Here we offer the Amish Furniture Hoosier Rocker, supplying your living room, den, nursery or reading nook with a classic rocker to enjoy and relax in. A spacious seat, smooth runners and an attractive display of spindlework make the Hoosier Rocker a charming, cozy piece to use and display. Dimensions: Width: 21" Depth: 18" Height: 43"
Originally used in gardens, rocking chairs indoors make a great seating option in many rooms. Consider them for use in your reading nook, to enhance a nook or corner, in the nursery, den, living room or next to the fireplace. 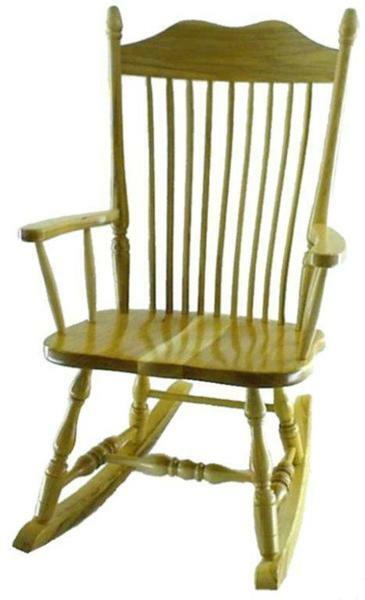 Consider our Amish Comb Back Child's Rocker to pair with our Hoosier Rocker.